Xiao Nai (Yang Yang) is a gaming expert who, courtesy of his basketball skills, academic excellence, swimming talent and game company presidency, also happens to be the most popular student on campus. 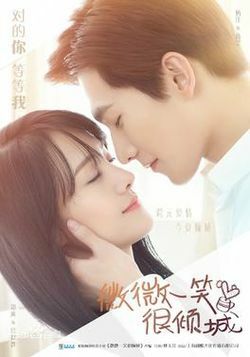 When he first comes across the gorgeous computer science major Bei Wei Wei (Zheng Shuang), the infinitely talented wunderkind immediately falls in love. But it’s not Bei’s looks that he notices; it’s the ridiculous mastery with which she is commanding her guild and owning everyone in an online multiplayer game that makes her impossible to forget. Now, Xiao Nai must use his skills both in real life and online to capture the adorable but dorky Bei’s heart. But does their love have the XP to succeed, or will this relationship never level up? It’s a weird drama. It’s one of a kind drama. I must say, I did not know what I went for when i started this. I saw it was very popular on SNS, and so I thought why not give it a shot, I was looking for a chinese drama anyway. It had a whole other side, than just being a campus drama. When the description say ’online gaming’, it really is an ONLINE GAMING drama. 40% of the drama took place inside a gaming platform. This fantasy element was new for me, but it didn’t bother me, in the end I came to like it. It was not realistic, but I applaud their intend, I could see they put a hard work in making those scenes, the costumes were formidable, and they were all so beautiful, like a chinese legend story. The actors were all good, but the rising star was definitly Yang Yang. He alone pulled through the chemistry with his leading lady when Zheng Shuan was a little stiff. The drama didn’t have a dramatic plot twist or mean people, but it somehow had it’s own flow and charms. To conclude an enjoyable, sweet, light lovestory.